The view from the Range Rover is startling. The huge windows, high seating position, and low hood make it appear as if you are flying. And with the 510 supercharged horsepower you very well could be. Of course the nearly three ton weight of this legendary, luxury British SUV keeps you grounded. Clearly, this is a vehicle for those who want to wear their Asolo boots one day and Testoni loafers the next because the Range Rover is a study in extremes. It can conquer some of the most grueling off-road challenges while cushioning your tosh in heated and cooled leather seats that wouldn’t look out of place at Buckingham Palace. The powerful engine requires top quality fuel and gets you 12 mpg, but at least you have the vicarious thrill of driving one of the fastest SUVs on the planet should you have to get your dog to the vet in a hurry. Keeping everything under control are the sophisticated Terrain Response four wheel drive system and a six speed transmission with gear selections for mud, snow, sand and even rock crawling. Why anyone would take such an expensive vehicle rock crawling is beyond our imaginations, but it is nice to know that if roads fall into any more disrepair it wouldn’t stop you from getting to the mall. Mom’s view: It is prettier on the inside, but all that beauty comes as a cost for even with a 23.3-gallon tank and sane driving you need to refill every 250 miles. To be honest, with all that power at your disposal you are most likely going to get considerably less as this is one vehicle that loves to kick up its heels. In terms of family use the Rover is very comfortable and can hold five adults with plenty of head room. You have over 70 cubic feet to cargo space with a myriad of storage areas. Safety-wise there are an abundance of air bags and even a hill descent control that slows the Rover if it builds up excessive speed on step grades. A great feature for those who drive in the local mountains. The tall SUV also has roll mitigation, a must for all such vehicles. Adding to that is a feature that automatically slows the vehicle down when the cruise control is on and traffic slows. I especially liked the height control that made it easier for me to get in and out of the Rover. I have no plans to put this SUV on my bucket list, but if it could afford it and lived in the mountains where its attributes could be more fully utilized it would be a fine addition. Dad’s view: Power corrupts and absolute power corrupts absolutely and the Range Rover S/C is guilty on all counts. This is an extremely capable and potent vehicle that looks like a slightly rounded brick with an interior right out of Architecture Digest. The power comes from a supercharged V8 and all that girth and energy is brought to a halt by immense 15-inch front rotors and 14.4-inch discs on the rear axle. We are talking thrill ride G forces here. The base Range Rover has enough power with 375 horsepower for most, but it is hard to ignore sound of the optional supercharged 510-horsepower V8 engine and its 461 lb-ft. of torque. The exhaust note if heady and if you turn down the sound system you can pick up the defiant whisper of the supercharger urging you to challenge the speed limit. But it is not just the power of the engine that corrupts you, it is the sublime suspension that levels out imperfections and still provides you with a nearly sports car style handling. Within minutes you forget you are driving a top heavy, three ton SUV as it magically shrinks in size with its precise steering and electronic monitoring. Fun, but I worry that the possible corruption to my driving record. 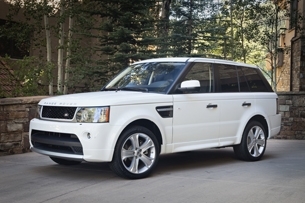 Young working woman’s view: You get what you pay for and with the Range Rover that is plenty. Standard equipment includes excellent bi-xenon headlights, dual-zone automatic climate control, hard drive-based navigation system, satellite radio, Bluetooth, audio interface, 20-inch wheels and even heated and recling seats for those riding in back. Overall, this SUV is out of my league. On the other hand, it is certainly the most desirable of it ilk. There is little question that its stunning interior and breathtaking acceleration need to be experienced. Obviously, the downside is the cost and fuel consumption. Young working male’s view: There is a huge touchscreen interface that is quite clear and the HarmonKardon audio system is awesome, but the radio is a bit slow to capture stations. There are a variety of option packages, including a non-supercharged version that is much less expensive. 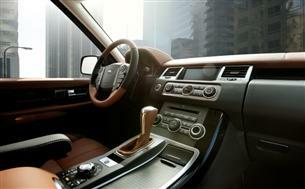 The sophistication of the Range Rover’s electronics may also be its weakness as it is quite complex. For example, you can raise the Rover to 11 inches or lower it to nearly curb height for easy access. The Terrain system controls the braking, accelerator response, and engine speed for off-roading excursions. Regardless, the S/C is a rare combination of versatility, class, and performance and that no other vehicle in this niche offers. Family conference: Read the owner’s manual is our best advice. This vehicle is loaded with special features that need to be experienced, but the numerous dials, gauges, and switches may intimidate the timid. The warranty is significant, but you should check out reliability rating. If you want to test the waters first, we recommend a lease. If you want to rise about it all, feel powerful and purposeful, the Range Rover provides that experience; just bring your gas card.